Before riding, please be sure to read our Rules of Engagement before participating in Team Portsmouth Rides. 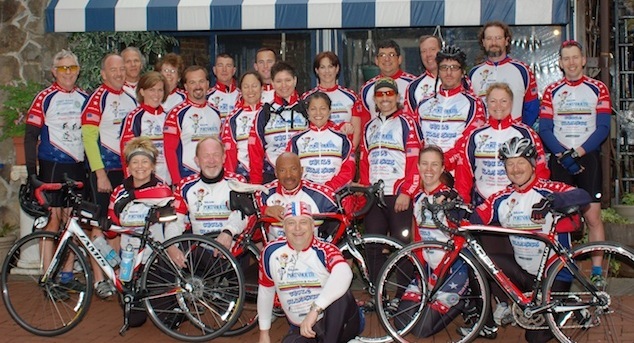 Our mission is to promote “Safe, Supportive, and Social" bicycling in South Hampton Roads for all levels of cyclists. Team Portsmouth is based in Portsmouth, Virginia. From weekly rides to area events, we are involved in a wide range of cycling activities. If you are a cyclist near Portsmouth and would like to ride with others, email or give us a call. We have TWO rides: Saturdays: B (16 - 18 mph) or C pace (14 - 16 mph) rides. Sundays: C to D pace (10 - 14 mph) rides. Flat terrain and little traffic. We normally start from Cycle Classics at 427 High Street. The routes and distances vary. NO ONE RIDES ALONE! It's a great way to meet other cyclists! HELMETS ARE REQUIRED! Afterward, we always stop at a Portsmouth eatery for food and fellowship. Need a new or used bike, parts, apparel, tune up, etc. - come inside the store after the ride! Anyone riding with us on Saturday gets 10% off any Cycle Classic Store purchase. 1. Tell an Ongoing Story to Your Potential Donors – Whatever length of time you plan to use for communicating with your potential donors, remember to tell them your story – who you are, what you are undertaking, why you are undertaking, where you will ride, when you will train/ride, and how you are doing. Make your communications a weekly update and include personal stories about your training rides, how you are doing (i.e. past charity ride successes, your training rides and cost of maintaining your bike in tip top condition, etc. ), any special donors (make sure you have permission to highlight a donor), and how you are coming in reaching your fundraising goal (each rider must raise at least $175). 2. Capture the Hearts of Potential Donors – When you ask someone to participate by donating $25, $50, or more, you have to connect on a personal level. For your donors, this becomes an “emotional” return on investment for them. Often, pointing out someone they might know having one of these debilitating diseases and how much it means to those afflicted knowing that someone cares, can create a powerful image. After all, you’re only asking them to donate an amount typical of a family of four eating at either McDonalds or a local restaurant once a month. Also, FUNraising tip #2 describes how much you and the team will train to be ready for these rides, so use something like this example to describe your commitment. 3. Demonstrate Your Personal Commitment by Setting a Goal – Let your potential donors know that you’ve set your sight higher than the minimum $175 required for the Tour de Cure or the $250 required for Bike MS. Consider setting at least a $500 to $1,200 goal. Also, let them know that Team Portsmouth has a team goal of $15,000 for the Tour de Cure. Page 4 shows some typical strategies for reaching these higher targets. 5. Make it Easy for Them to Give – Having your web page set up and sending emails with your two web sites as links within your emails is about as easy as you can make giving. Other easy forms of easy giving include auctions, garage sales, selling on Ebay. What’s YOUR easy way to get donations? 6. Don’t Start Fundraising Too Early or Too Late – You have to know your potential donors to determine this, but most of the time more that 6 weeks is too long. One exception to this is getting donations from companies that often must have their annual donations already included in their annual budget or get an authorization for donation from someone senior in the their company and this may take some extra time. 7. Ask Your Potential Donors to Pass Along Your Communications to Others – Ask your potential donors to pass your emails along to 5 of their friends. This is a powerful way to increase the size of your donor base. Often, your potential donor will pass your donation request along to others that they know will give. 8. Ask Your Potential Donors for Others that You Can Contact – If you use this strategy, I would recommend that you do this one-on-one with each of your potential donors. Permission based marketing means exactly what it implies – you MUST get their permission. 9. Recognize that Companies and Individuals Often Give Differently – Companies often have a “donation” amount authorized and built into their annual budget. For well established businesses, a donation of at least $1,000 is very possible. Other companies may be willing to create a matching gift. Getting companies to sponsor you and Team Portsmouth can really help increase how much we raise this year for both ADA and MS! 10.Thank Both Those that Give and Those That Do Not – Two years ago a smaller Team Portsmouth sent an email out to all the potential donors thanking those that gave AND thanking those that had allowed us to continually update them on our progress. When that team returned the Monday after the ride to tally up all the gifts, a large number of potential donors gave after that final email and actually increased the final team’s fundraising by 30%. Bottom line – thank everyone! The new Team Portsmouth store is now online and operational. You can visit it by clicking the "Team Gear" link in the top navigation bar.